The entire Dara Security team is honored and humbled to receive this award. 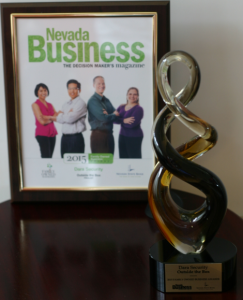 Many thanks to Nevada Business Magazine, Nevada State Bank, and their sponsors for recognizing our team's efforts. We are energized to reach greater heights! When discussing the issue of cybercrime in the healthcare sector, one topic comes up time and time again: money. Barry Johnson, president of Dara Security: "A lot of it does boil down to budgetary issues." Jason Polancich, founder of SurfWatch Labs: "Funds are at a premium in healthcare." Kevin Jones, senior security architect at Thycotic: “I think a lot of what we’re going to see in healthcare is they knew it was a problem … but because of budget and things like that they didn’t have time to action on it." All three joined us for yesterday's HackSurfer Hangout to discuss cybersecurity in healthcare and take questions from viewers. Read the full article at hacksurfer.com. Dara Security will be featured on the Business Matters radio show with host Chip Evans. Chip Evans will have our team broadcasting live during the Profiles in Business segment of his show, an opportunity that we are very eager and excited about. Our firm will be featured from 1 to 1:15 p.m. on KRNG 101.3 FM on Tuesday, August 26. [LOGIN INFO: UserID - show | Password (Case Sensitive) - Show] Then Scroll to the 8/26/14 podcast. Branded as "talk radio to explore the opportunities and challenges in starting and growing a successful, sustainable business," early shows have featured the many valuable services available to small businesses through two national channels – Small Business Development Centers and UPS Stores. Recent shows have presented the value of systems thinking and continuous process improvement, the opportunities to buy or sell businesses and perspectives on our national economy to help business planning.